Down four runs heading into the seventh, Monticello softball needed something big. Instead they got a bunch of small things that turned into something big. A walk, a double, a sacrifice bunt. Then, with two outs, a Hayley Shifflett unleashed a three-RBI single to tie the game followed by Kierstyn Zimmerman doubling to center to score Shifflett. 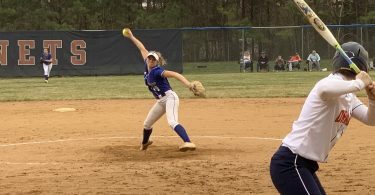 That put the Mustangs up 10-9 and Emily Morris pitched out of a jam in the bottom of the seventh with a pair of strikeouts to give the Mustangs the one-run win. Zimmerman finished the night with three RBI while Shifflett went 3-for-4, scored twice, walked twice and knocked in four total runs including the critical single. Mackenzie Walker posted a double while Shianna Harris, Makenzie Turner and Alecia Barbour each knocked in a run. Morris struck out nine but surrendered eight earned runs in the circle. 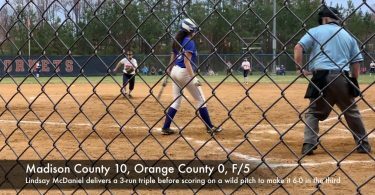 The Mustangs’ rally marred Fluvanna’s own strong offensive night as senior Montana Dudley led the way with a 3-for-5 night with three RBI and two runs while Gracie Walton and Lindsey Ward each had two RBI. Calista Marsh chipped in an RBI as well. Walton had a solo homerun in the bottom of the sixth that put Fluvanna up 8-5. The Flucos will look to bounce back on the road against Orange County Thursday while the Mustangs host Albemarle the same night.